Maia provides a number of smart features to make working with Android resources simpler. … and from Java code to resource files. Usage search for resources. That is, when you are searching for usages of res/drawable/android.png resource file you will find both XML (@drawable/android) and Java references (R.drawable.android). 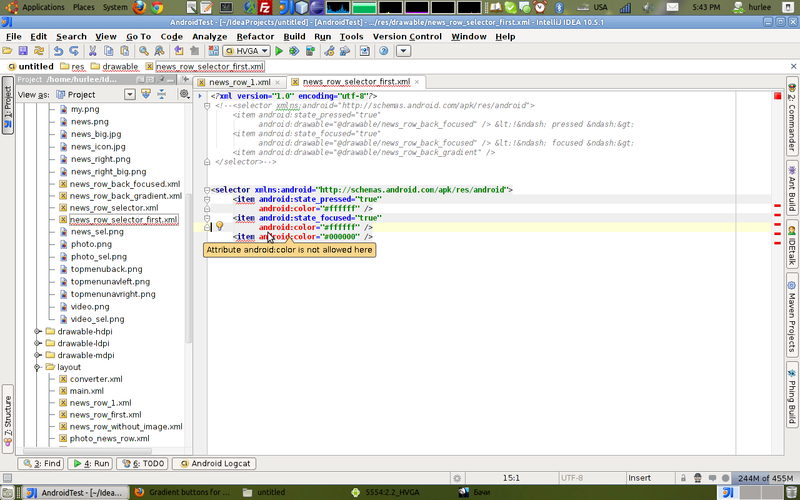 By the way, searching for usages of R.drawable.android Java field yields the same results. Rename refactoring. When you rename a resource file (i.e. res/drawable/android.png), all XML and Java references are updated automatically. Renaming of R.drawable.android Java field, as you may have guessed, has the same effect. Note that now renaming of a resource represented by an XML descriptor is possible only through renaming an appropriate Java field. This entry was posted in New Features and tagged Android, Code Navigation, Maia. Bookmark the permalink. but it is not working. Error is “Attribute Android Color is not allowed here”.